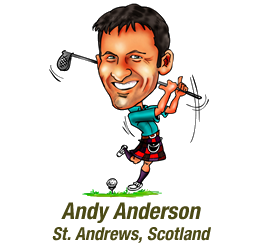 On 2nd October 2011 I followed Michael Hoeyâ€™s progress over the last 9 holes of The Old Course, St Andrews during the Alfred Dunhill Links Championship. Walking the final stretch it was a real treat to see all of the mental golf game processes built by Dr Karl Morris and Hoey prove to be so effective under such immense pressure. Equally the importance of having a strong mental game was evident back in 2010 when another one of Dr Karl Morrisâ€™ clients Louis Oosthuizen won the Open Championship. Ever since I interviewed Karl back in 2009 I have considered him to be a friend and someone I can definitely turn to for the very best advice on how to improve my own mental golf game. This is a certainly a privilege considering Karlâ€™s other clients include 2010 US Open Champion Graeme McDowell and 2011 Open Champion Darren Clarke. Today I would like to share with you 7 ways Karl has taught me to improve my mental golf game. As previously mentioned one of the best displays of concentration and confident play around the Old Course I have ever seen was that of Louis Oosthuizen playing in the final round of the 2010 Open Championship. I can only imagine the number of distractions a player faces as they tee off in the last group of a major. Like me you you may be wondering how does anyone handle that kind of pressure and have the ability to concentrate for 4-5 hours. Fortunately by carefully studying Louis’ play on that Sunday you can learn how to apply the same principles of concentration to your own mental game. Surprising as it may seem, Louisâ€™ goal that week was not to win The Open. It wasnâ€™t even to qualify for the following year or make the top five. It had nothing to do with his score. He simply made it his goal to perfectly perform his pre-shot routine on every shot. In doing so he naturally scored well, but his attention was not on the numbers but instead on the task of repeatedly executing a successful pre-shot routine. Thereâ€™s a massive lesson here for you, if a professional tour player isnâ€™t preoccupied with their score why should you be? You may then ask how did Louis have the focus to ensure he stuck to his plan and never waiver. This he did by drawing a red dot on his glove. The red symbolises the colour Louis thought best represented the word â€œconcentrationâ€, a word that he told Karl summed up the best round he had played that year. In an affect he anchored the good feelings that came from having great concentration on the course with the red dot on his glove. Setting an anchor in this way, whereby a task is enhanced by programming yourself to relate to past experiences, is a proven Neuro Linguistic Programming (NLP) technique. The red dot is a visual â€œtriggerâ€ and by looking at it Louis was able to allow his unconscious mind to experience the mental state set by the anchor. Alternatively you can also use a spoken or tactile version. My friend John Richardson used the word â€œbrilliantâ€ as an anchor for his own positive mindset during the year he broke par, where he went from a control round of 103 to an amazing one under 70. Fred Couples uses a tactile trigger. Notice the way in which he pulls at his shirt, this is his method of creating a confident demeanor prior to striking the ball. How often have you finished a bad round of golf knowing that ultimately your high score was due to poor behavioural chains rather than a run of awful golf swings or poorly judged shot choices? Imagine hitting a slice on the first hole, leading to a double bogey. This particular scenario can create frustration when previously you had spent half an hour on the range drilling the ball down the middle. You then start to get angry and ask yourself why did you even bother to practice. On the second hole you slice again, the ball is playable and with some smart course management you should still par the hole. Unfortunately this is far from your thoughts. You are still frustrated at wasting time at the range and you feel self doubt starting to creep in. You hear yourself thinking perhaps you should have worked on another technique and asking why did you bother changing your swing. Then next you are actually blaming your coach for your own shortcomings. Subsequently these negative feelings affect your putting, usually the strongest part of your game, and before you know it the first four holes are a disaster simply because you couldnâ€™t control the initial frustration you felt after your opening drive. If this is you, you are not alone. We have all been there and it’s imperative you break this thought chain as quickly as possible. The ability to be mentally tough and bulldoze any negative self talk out of your mind is critical to your long term success on the golf course. Itâ€™s inevitable shots will be dropped due to poor play. Once you accept this you are in a far better position to control your emotions and not let any frustration and anger build up inside you. Karl calls this building mental resilience and exercising damage limitation before playing the next hole. Too many golfers play with cluttered minds, continually confused at how some swing thoughts tend to work well done one day and not the next. In a nutshell we are all guilty of having far too many swing thoughts out on the course. Contrast this to what Karl recently told me. He said that all of his top players have their best performances when their minds are quiet. There’s no doubt that this calm approach leads to better scoring. Initially every golfer begins their shot by thinking about their lie, the effect of the wind, the distance to the target, what hazards to avoid, but ultimately they must clear their mind before striking the ball. Having processed a lot of information and then deciding on the type of shot to play, it is essential to trust your decision and clam your mind. The solution is to park your attention in one of four places, namely the ball, club, target or yourself. By focusing on just one of these four options you will drastically reduce the number of swing thoughts and allow yourself to successfully hold your attention during the shot. Karl talks further about conquering your swing thoughts in video 7 of these 8 free golf tip videos. Itâ€™s probably safe to assume you have been distracted once or twice on the golf course! It happens so easily, especially when you get side tracked thinking something should have happened. Here are some examples you can probably relate to. I should have made birdie. The ball should have gone in. I should score below my handicap based on my front nine. I should be more than two up. I should win this match easily. They should let us through. These are all judgements about what should have happened in the past or what should happen in the future. To be blunt though they don’t serve you well, as they stop you from focusing properly on your next shot. As hard as it may seem you will play your best golf when you stay in a neutral mindset. You canâ€™t continually be making judgements on what should happen, this disrupts your ability to concentrate. Golf is played in the present, not the past or future. Take the advice given above using a trigger to turn your concentration on and off, so as you conserve the mental energy you use during the four to fives hours on the course. Itâ€™s important to realise that 85% of golf is not golf. The aim is to maintain your focus and concentration during the 15% of time you are actually playing golf. This means staying in the present and not thinking about what should have happened or what should happen in the future. Picture the scene. You walk onto the tenth tee and ask yourself why you have dropped so many shots on the front nine. Next you immediately begin thinking whereâ€™s the trouble on this hole? The conservation continues like this. Where should I play to avoid the bunkers? Why does each hole seem difficult? Why arenâ€™t I swinging as well as I did on the range this morning? Each question creates anxiety and removes you further from the relaxed focused state you should be in. Of course you should take note of the hazards but only so as you can answer the principal question you should have for every shot. This question is â€œwhatâ€™s my target?â€ Harvey Penick wrote in his book â€œThe Little Red Bookâ€ that we should all â€œTake Dead Aimâ€. We should know exactly where we want the ball to land on the green or fairway. Once we are absorbed by thoughts of the target we allow the subconscious to take care of hitting the ball. Itâ€™s hard to play golf without expectations. Typically you come to the course with expectations based on your previous round or practice sessions. Itâ€™s difficult to not raise the bar or lower our expectations based on recent events. Itâ€™s a natural thing to do, but ultimately will harm your ability to score well. Your judgement on whether you are playing poorly or well is all based on expectations, or in other words what you expect to happen in the future. This is a destructive way to think. Golf should be played in the present, concentrating on each shot in the moment. Any kind of expectation can cause pressure and tension, leading to poor shot execution. Take the situation where you play the first nine in a medal well and start to dream about posting a good score. We have all been there and instead of focusing on each shot independently you start to focus on your scorecard. Your expectations increase, you begin to feel some tension and before you know it you have given back all the shots you gained on the front nine! It’s far better to follow the advice Karl gave to Louis Oosthuizen, namely stop thinking about your actual score and begin to score your round by marking the number of times you perform a perfect pre-shot routine. Whilst itâ€™s a given you will a bad shot, only you can say how long you will ponder it and allow it to eat into your confidence. The longer you dwell on a poor shot the more you will frustrated and unable to concentrate on the present. Granted you can learn from your mistakes but spending too much time thinking about them is a waste of time, particularly on the course. The solution is to develop a strategy for dealing with bad shots. Karl recommends breathing out completely after a bad shot to expel negative energy and then replacing your club in your bag with the word â€œdoneâ€. I’ve looked at many sources for golf tips and this is by far the best. I’ve been playing for 30 years, and like many in the 14 handicap range, my game has peaks and lows. lately i’ve been hitting the ball fat, and your advice from setup to swing plane has helped me. Through hitting balls at the range and playing, I’m striking the ball better, with my divots in front where they should be. I try not to carry too much information with me when I play, but I’m more comfortable and relaxed over my mid iron shots than I have been in the past. Hi Andy, I have just read your remarks on the MIND game, and I can only say that you are 100% right. We had our Captains day last July and one of the prizes that we give every year is ( Mr Blobby ) that is a prize for the MOST number of Blobbs on the day. I had not been playing very well and one of the members joking said (you stand a good chance of getting Mr Blobby today Dave). That comment turned my whole attitude to the game and there was no way that I was going to get Mr Blobby. I had made my mind up to try and play better on the day, which meant I had to work alot harder and be VERY positive in all my shots, and to do this I had to keep saying to myself ( POSITIVE MENTAL ATTITUDE) PMA and my putter was like a magic wand everything fell into place and I WON the Captains cup. So it doES work but you have to be POSITIVE. Thank you for all your advise and help. Dave. Now that I’m back in South Africa for the winter I’m enjoying hot sunshine – but!- my club, Reading CC has a few difficult holes, one of them , the 9th Stroke Index 2, is a very difficult par 4, and yesterday I was on the green in 2 having hit two of the best shots of the day. What did I do? Being 10 feet from the pin with the chance of a very rare birdie, I allowed negative thoughts to enter my head and I three putted! I certainly am going to try Dr Karl’s advice next week. Thanks for all the info, very useful.